Toll roads aren’t the cash cows they used to be. The assumption that the roads will “pay for themselves” is no longer a reliable one, and credit rating agencies are taking notice. In Orange County, California, traffic on the San Joaquín Hills toll road is half what was projected. A recent toll road extension outside of Austin, Texas, is also seeing just half the expected traffic volume, leading the company that oversees the road to cut toll prices in hopes of attracting more “customers.” Moody’s Investor Services has downgraded the company’s credit rating. In the DC suburbs, the Inter-County Connector and new high-occupancy toll lanes along the famously congested Capitol Beltway are both getting far less than half the use that was projected. 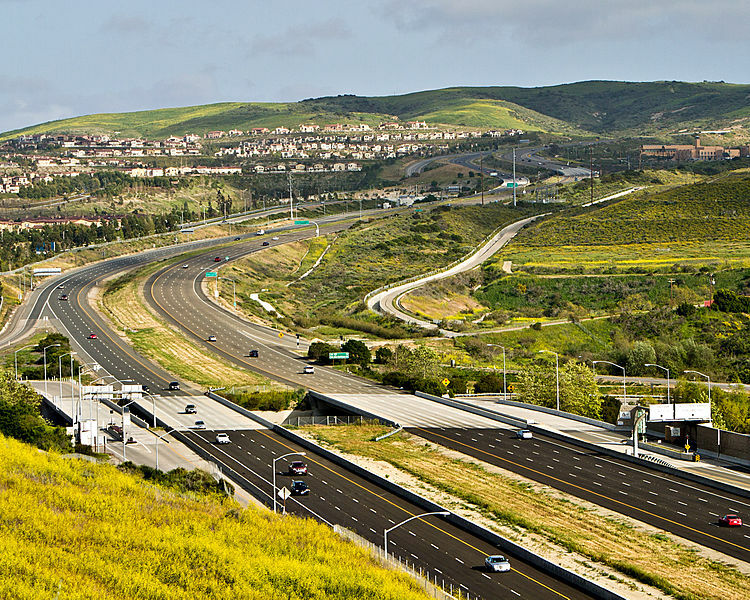 In San Diego County, the private company that built and operated the South Bay Expressway went into bankruptcy when the cars failed to materialize. The federal loan program for transportation, TIFIA, now looks at only one criterion when choosing projects. Prohibited from considering public benefit, regional significance, or environmental impact, U.S. DOT staff chooses projects on the basis of credit-worthiness alone. The conventional wisdom holds that toll roads are the natural beneficiaries of this approach, since they include a mechanism for paying the loan back — but stories like those above indicate that that assumption should be re-examined. Of course, road projects have always required subsidies. Nearly 50 percent of road spending is covered by general taxpayer funds. If these roads aren’t paying for themselves and people are finding other ways to get around (transit, alternative routes), maybe we need to rethink urban freeways in general. people are also buying more online and in less trips. in the 90’s you would stop by a supermarket a few times a week. today you might do it once a week and buy everything you need. Love Higher Taxes for Roads! I believe these roads would fill up in a few years if it weren’t for the toll. Just goes to show that if you ask drivers to pay closer to the full cost of driving they’ll decide it’s not worth it. But when driving is heavily subsidized they’ll drive as much as they can. same in NYC. the toll midtown tunnel is not that bad driving into manhattan. but over the Koch bridge which is free the traffic is a lot worse. A fundamental problem with almost all of these roads is that they don’t actually go where anyone wants to go. The 73 and the 241 in Orange County offer vastly inferior destinations to the 5 and the 405, which are free. Same goes for the 130 in Austin, which is out in the sticks compared to the free I-35, which runs right through Austin and San Antonio. These roads provide distant bypasses around urban centers, ignoring the fact that a lot of traffic on urban freeways is not through traffic. The ICC is your classic East Coast outer beltway, built to accommodate growth that NIMBYism won’t allow closer to the core; there’s not even a plausible route that the ICC would be relieving – it’s a pure sprawl anticipator/generator. As for the Capital Beltway… those lanes are pretty new, so maybe the jury is still out. In LA, instead of building new lanes, they converted existing HOV lanes on the 10 and the 110 to toll/HOV lanes. These routes do actually provide a real alternative to the free lanes. But thus far, evidence suggests that drivers do not value their time nearly as much as planners think they do. The tunnel itself generally has less traffic than the bridge, but the surface streets on the Manhattan side are just as bad if not worse when you get out of the tunnel. This obviates much of the time savings from the tunnel vs. the bridge. LetsGoLA I believe has it right: I generally am on board with Streetsblog’s conclusions, but I do not believe it is correct to take what appears to be a wholesale ‘no’ position on toll lanes, especially when the older projects have generally been built on lower-demand areas. Take the 91 toll lanes in Orange County, for example. They are profitable enough that revenue from them is being used to add more free lanes. Obviously this is a lamentable use of the toll revenues, but it clearly demonstrates that, when placed wisely, HOT lanes can actually be profitable, and the money could at least theoretically go toward providing more bus service, improving pedestrian infrastructure, etc. I think that these comparisons are problematic because most of these newer toll roads have competing free-flowing freeways nearby. There isn’t a single American metro area where the majority of highways are tolled. And I think that I was getting at, but from a different direction. If these toll roads aren’t being fully utilized (which may be because traffic is pushed to other non-tolled roads) then there is obviously a disconnect between the treatment of tolled and non-tolled roads. So you have two choices: 1) Switch to all non-tolled and have an implicit tax via federal income taxes. In this scenario, people don’t have a direct knowledge of where money is being spent and all spending is pretty much with “other peoples’ money”. Or 2) You convert all freeways to tolled, people see the direct cost of their driving, decide whether that cost is worth it, change or maintain status quo, and then we evaluate whether these expansive grade separated behemoths are worth it. If I had to make a guess, if tolling became the norm, we would see many freeways, especially urban freeways, go the way of the dinosaur. Between the cost of maintaining and the lost property tax revenue, I think you would see a major shift. If tolls were to be imposed on existing (paid off) highways at a level enough to recoup its long-term maintenance costs (including periodical resurfacing, overpass replacement etc), they don’t need to be too high. The issue with more recent toll projects is that they are used to finance the capital costs of construction, including items like land acquisition, earth movements, substructure, drainage etc. These costs might be high. Therefore, when a toll road goes bankrupt, once debts are discharged they can operate with lower tolls meant for pay for their operational costs. This is what happened to DEnver beltway, for instance. Again, I do think there is reason to be cautious – especially projects contingent on low density exurban real estate deals like the Pocahontas Parkway – but (just like with transit projects) the specifics of the project matter a lot. What is more interesting is that these new roads are not profitable despite having lower labor costs given their use from day one of mostly automated toll collection. The cost of toll collection are not that much relevant as the capital costs of construction whose debt is loaded on the toll authority. There is building new toll roads, and then there is applying new tolls to existing roads. Take the case on the interstate highway system. Currently two interestates in 3 states have been exempted by the interestate tolling ban since 1998, outlined in Planetizen: Interstate Tolling, the Third Rail of Transportation User Fees, Finds Fans. Seems to me that expanding tolling to existing interstates – and other major highways, makes much sense. It is also a more practical, though perhaps politically unpalatable, alternative to building HOT lanes – most often done with lane additions as opposed to conversion. Planetizen also covered last December the junk bond rating of the Orange County toll roads described above. If TIFIA is only supposed to be used for credit-worthy projects, they won’t make any loans at all. Transportation doesn’t pay for itself. Period. I suppose TIFIA could be used for loans to municipalities which plan to make money by improved sales tax or property tax receipts (because transportation *can* be used to increase property values and business activity). But all other loans will be impossible. Creditworthiness is just a measure of the ability to pay back the loan. i.e, do you have a projected stable revenue stream to pay back loan. Whether a toll income or farebox recovery for transit or a ballot measure-approved sales tax, it just has to be a predicable revenue stream.